Sigmund Freud visited New York in 1909 for his only trip to the US. 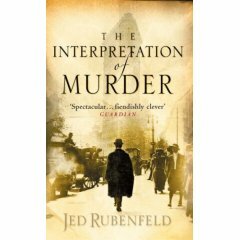 His experience forms the backdrop to The Interpretation of Murder by Jed Rubenfeld, with Freud and Carl Jung joining a cast of both real and imaginary characters in this lengthy crime novel. Although it might give that impression when first picked up, The Interpretation of Murder doesn’t cast Freud as a Sherlock Holmes character. Instead the sleuthing is left to two fictional characters, Dr Younger and Inspector Littlemore, the former a keen practitioner of psychoanalysis (and a fan of Shakespeare to boot), and the latter a conventional New York cop. Murder and sexual perversion are at the heart of this novel. A girl is apparently murdered, with another left molested and disturbed. Younger and Littlemore to the rescue but … sorry … I can’t go on. Unfortunately The Interpretation of Murder is a real bore. Freud and Jung, by far the most interesting characters in the novel, remain mostly in the background as the increasingly convoluted plot takes hold. Rebenfeld may know his subject matter (he’s written a thesis on Freud) but he’s no novelist. This novel lacks pace, believability and any real sense of mystery. As a writer, I’d put Rubenfeld in the Dan Brown league. And that’s not a compliment. The novel has been praised for the authentic depiction of Manhattan at the dawn of the 20th Century and in part I agree; the relentless building work as skyscrapers are rapidly erected, the social divides, the emergence of the automobile – by far the best part in the book is where the crazed villain of the piece hauls a distraught horse up in the air by a crane – but it isn’t substantial enough. And Rubenfeld let me down. Another interesting part of the novel is the description of the underwater construction of the foundations for New York’s bridges with workers risking their lives in the subterranean caissons. Alas the truth of this has to be stretched a little to serve the plot, which ruins the supposed ‘educational’ aspect of the book. Note to self: avoid bestsellers. BBC4 is running this book as a radio dramatization, and I made it through a couple of episodes at the “Listen Again” page but did not return to hear more. Your review makes me think the problem was not just my short attention span. Fay: no not at all. If it wasn’t for a transatlantic flight with nothing else to keep me occupied I would have probably given up! Oh, what a shame! I was thinking about reading this book at some point in the future. I don’t think I’ll bother now, so at least you’ve managed to save me some wasted time. Thanks for the honest review! My partner was given this book for Christmas 2006 but had only read the first chapter before giving up. I took the book on holiday this week and decided not to read any further after about a quarter of the way through. Now I’m someone who loves to read and will read absolutely anything. I didn’t have anything else to read with me either so that gives you an idea of how distateful I found it. I’m a psychotherapist and I found the psychoanalytic “stuff” worryingly simplistic and misogynist. Perhaps I would have changed my mind if I had read on; but maybe not! What depressed me mostly was that this book featured very high in the list of bestsellers in the UK for 2007. I know we shouldn’t pay too much attention to these things, but it’s usually obvious why a particular book has become popular and has sold so well. But I couldn’t tell why people in their thousands bought this. Use preview and then submit.